When processing multiple shipments a picking list can be printed to consolidate the items on the selected goods-out notes into a handy summary for collecting the items from around the warehouse. Printing a picking list will mark all the goods-out notes as picked and record the date/time. If a goods-out note is picked by mistake, or needs repicking it can be marked as unpicked and then picking can be redone. If required, you can print and pick your goods out notes with one click using the 'Print & pick' button. When selected, one tab will produce packing notes ready for printing; and another tab will show the picking list; and the selected goods out notes will be marked as both printed and picked with one click, helping to save you time. You can also 'Unprint & unpick' your orders with one click too in case you’ve made a mistake. If you would like to use the 'Print & pick' feature and are using Google Chrome; then you will need to amend your browser settings to allow for both popups to appear at the same time, as per the instructions below. Go to Sales > Goods-out notes Due to pick . Use the filters to display the goods-out notes for the relevant warehouse, shipping method, SKU or order if relevant. Specify how many goods-out notes should be listed using the #results field (max 500) - this will be the number of goods-out notes that can be included on a single picking list. Select the goods-out notes to be picked and click the Pick button. The picking list will be loaded in a new browser window/tab - items are listed in SKU order, or location order if used. The goods-out notes are automatically marked as picked. Send the picking list to the printer. 1. In the top-right corner of Chrome, click the Chrome menu. 4. Under "Privacy", click the Content settings button. 5. Under "Pop-ups", click Manage exceptions. 6. 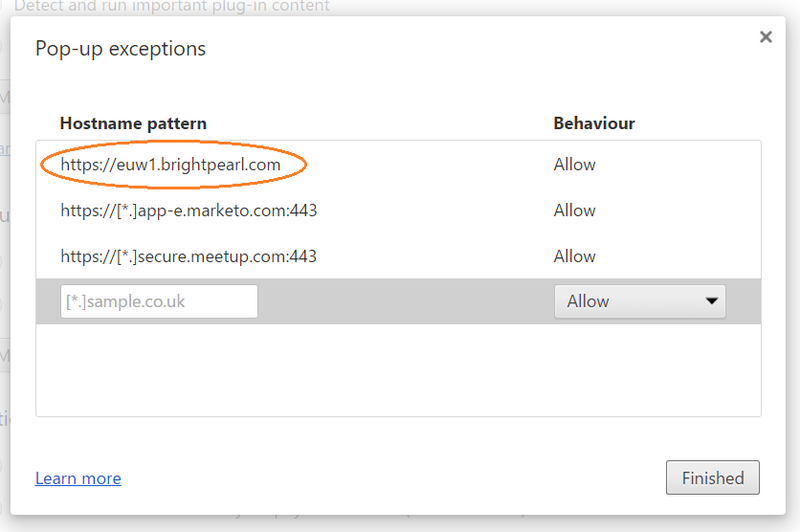 Enter your Brightpearl URL (eg https://euw1.brightpearl.com} - you can see this whilst logged into your Brightpearl account.